Langley RibFest is all about the Ribs. Well, mostly about the Ribs. Vegan, vegetarian, and beef-based dishes will be served too - so there's something for everyone! The Ribbers though, they're kind of a big deal. Meet the lineup of Ribbers and other food vendors, set to serve up their best of the best. GuerillaQ has been Ribbin’ the dream since 2013. A local Fraser Valley business, pitmaster James Moran and family have been serving up authentic southern style bbq for 5 years in the valley as well as serving country’s biggest stars as the Rockin River artist caterer for the past 3 years. All of our rubs and sauces are scratch made and we focus on serving the best quality product. We are very excited to be in our first ribfest in our own backyard! Prairie Smoke & Spice BBQ is Canada’s Winningest BBQ Team – they have won 18 Grand Championships – more than any team in the country. Highlights include the 2013 & 2014 Jack Daniels World Championships (1st Place Chef’s Choice) in Lynchburg, Tennessee, and the Canadian National BBQ Championships. With well over 180 awards in professional barbecue, nobody brings more bragging rights to the picnic table. Rob Reinhardt is the head cook and when Rob comes to town, you know you’re getting the finest BBQ available anywhere. We hand-trim our meat, season with our signature spice rubs, and smoke to tender perfection. In addition to travelling to Ribfests, Rob runs the largest BBQ school in Canada, has a food truck on the streets of Regina, and serves as Vice President of the Canadian BBQ Society. Smoke and Bones BBQ is Vancouver’s International award-winning barbecue company that specializes in the art of,” Low and Slow” southern barbecue, entirely authentic and cooked in "big ole smokers" from the Deep South using a hardwood fire and coals. In their quest for perfection, Smoke and Bones has travelled back and forth across the Southern United States competing and racking up awards in the biggest and most prestigious barbecue competitions on the planet. Not only have they won numerous wins and championships, including Best Ribs at the Best of the Best Invitational Competition in Georgia, they have garnered an incredible wealth of knowledge about the regional flavours on America's favorite cuisine. Their experiences have brought home the very best the South has to offer and allowed them to “cherry pick” the best of those distinct flavors from places such as Texas, Georgia, and the Carolinas. This has been crafted into their own menu offerings, which have proven to be exceptionally well received and reviewed by judges all over North America. Their success on the domestic and international stage has created such a demand for them that they operate the busiest and most sought after barbecue catering operation in Vancouver as well as the hottest new full-scale BBQ restaurant. Matt and Louise Smith acquired the rights to Gator BBQ in 2006. The family- run business with children Kurt, Nick, Aaron and Alexis is a successful unique business which continues to grow. Since 2006, the Smith family has grown their fleet from one to four rigs with a fifth rig in the construction stage. The family has attended various Ribfest shows across Ontario down into the United States and is now expanding into the Western part of Canada including the Kamloops Ribfest. The Smith Family has perfected award winning recipes including best sauce, best ribs, and overall best rig. Foods such as pulled pork, bbq chicken, “to die for” ribs and beef ribs have become their trade mark along with side dishes such as baked beans, fries, and their own special seasoned gator tator tot. 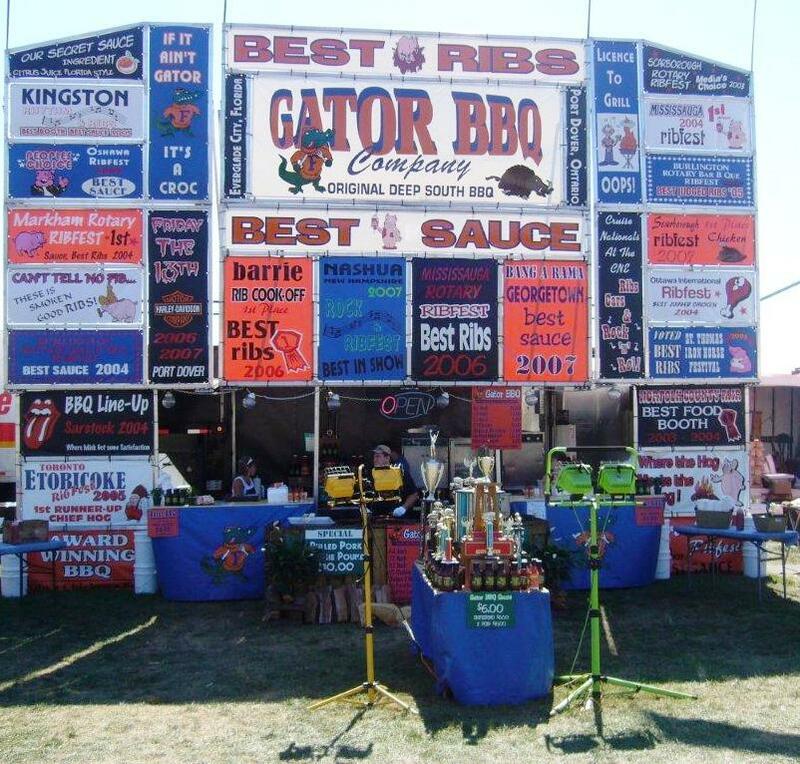 Soak up the entire Ribfest atmosphere and stop by the Gator BBQ to introduce yourself to a Smith Family member. Lots more information coming soon! Sign up to our newsletter below for the latest updates.